Central Florida Health Welcomes Dr. Baig! Central Florida Health is Leesburg’s premier Medical Group and they are growing! Dr. Ajmal Baig is a board-certified and fellowship trained general surgeon. Specializing in minimally invasive and robotic surgery, Dr. Baig uses these techniques in robotic surgery to deliver outstanding results. Being on the cutting edge of technology is always a goal of his. 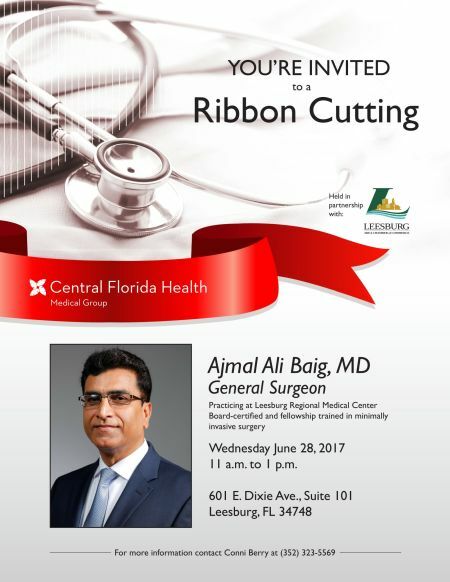 Having Ajmal Baig, MD at Central Florida Health and as a member of the Leesburg Community is something we are all very excited about. Join us as we celebrate Dr. Baig’s arrival at a Ribbon Cutting. The Leesburg Chamber of Commerce will be holding a Ribbon Cutting Ceremony on Wednesday, June 28th at 11:30am. Come out and see what Dr. Baig is all about! 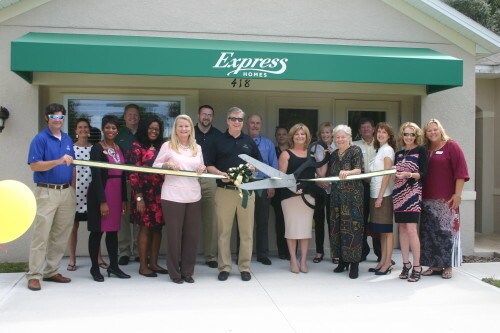 LEESBURG, FL – October 27, 2015 – Express Homes Central Florida Division and the Leesburg Area Chamber held a ribbon cutting ceremony at their new Ashley Woods neighborhood in Leesburg. The event was well attended by a number of guests including Pam Jones from Congressman Daniel Webster’s office, Leesburg Chamber of Commerce members, County Commissioners, local businesses and area real estate agents. The guests were given tours of the community, which offers eight floor plans to choose from. Homes at Ashley Woods range in size from approximately 1,672 to 2,675 square feet and are currently priced from $169,990 to $211,990. For more information, call sales representative Helen McCroy at 352-435-7685. Quality Inn & Suites celebrates new hotel management. Leesburg, Florida – On Tuesday, August 25, 2015, at 4:00 p.m., Quality Inn & Suites, along with the Leesburg Area Chamber of Commerce, will celebrate their organizational milestone with a Chamber Ribbon Cutting Ceremony. The ceremony will take place at Quality Inn & Suites, located at 1392 W N Blvd, Leesburg, Florida and begins at 4:15p.m. Quality Inn & Suites is a part of the Choice Hotels family. A national brand that strives to offer comfort and convenience. Quality Inn & Suites offers relaxing and refreshing non-smoking guest rooms, all of which feature expanded cable television channels, flat-screen televisions, coffee makers, desks, in-room tea and coffee and spacious showers. Some rooms offer a living room, sofa and a table with chairs. As well as complimentary hot breakfast, wireless high speed internet access, daily newspaper, coffee and parking. Reserve your room at the Quality Inn & Suites hotel in Leesburg, Florida today and for more information about the Quality Inn & Suites visit, https://www.choicehotels.com/florida/leesburg/quality-inn-hotels/flc76. Dee Place LLC-A great resale thrift shop. Leesburg, Florida – On Friday, August 14, 2015, at 10:30 a.m., Dee Place LLC, along with the Leesburg Area Chamber of Commerce and the City of Leesburg, will celebrate the Grand Opening with a Ribbon Cutting Ceremony. The ceremony will take place at Dee Place LLC, located at 1305 Sunshine Ave. Leesburg, Florida, across from St. Paul’s Catholic Church in the former food bank building. The ceremony begins at 10:30 a.m. with coffee and donuts, followed by the ribbon cutting at 10:45a.m. Come listen to live music and mix and mingle with residents, friends and area guests. Dr. Diane Spurlock owner and operator of Dee Place LLC has been selling quality clean second hand merchandise since 2013 and will continue to offer a variety of items such as clothing/accessories, furniture, electronics, crafts, household items and collectibles at her new location. Dee Place LLC will cater to the needs of the community with extended and weekend hours and weekly specials. Operating hours: Thursday, Friday, Saturday and Sunday from 10 a.m. to 6 p.m. If you would like more information or to visit Dee’s Place LLC please call Dee (Dr. Diane Spurlock) at 352-323-9099. Come Celebrate 25 years of the Good Life. 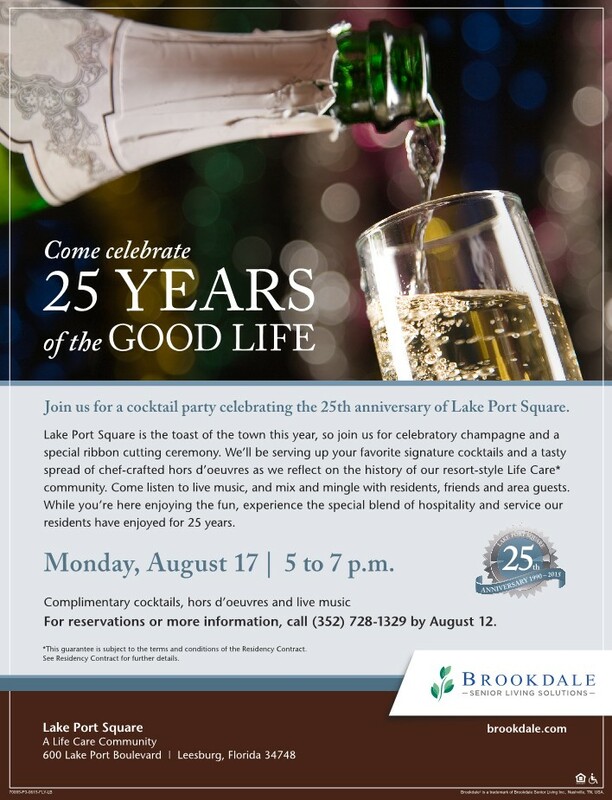 Leesburg, Florida – On Monday, August 17, 2015, at 5:00 p.m., Lake Port Square, along with the Leesburg Area Chamber of Commerce, will celebrate 25 years with an Anniversary Ribbon Cutting Ceremony. The ceremony will take place at Lake Port Square, located at 600 Lake Port Blvd. Leesburg, Florida. The fun begins at 5:00 p.m., with signature cocktails and a tasty spread of chef-crafted hors d’oeuvres followed by the ribbon cutting and music. Come listen to live music and mix and mingle with residents, friends and area guests. Lake Port Square is Brookdale Senior Living Solutions property. Nestled on 78 park-like acres, on the shores of Lake Harris in Leesburg, Lake Port Square is in the heart of Florida’s chain-of-lakes region. Part of the Lake Port Square continuing care retirement community, this community offers skilled nursing, continuing care and retirement community. Lake Port Square offer a number of distinctive services and amenities designed to make your stay a excellent experience! Lake Port Square strives to create an atmosphere that provides residents with a sense of comfort, dignity and well-being, all in a warm, familiar, homelike setting. If you would like more information or to take a tour of Lake Port Square please call Lake Port Square Health Center at 352-728-3366 or visit https://www.brookdale.com/communities/lake-harris-health-center/. 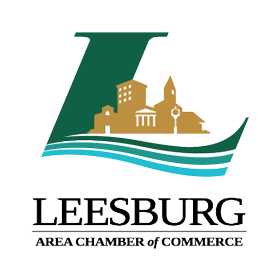 Receive occasional emails with information about the Leesburg Chamber.